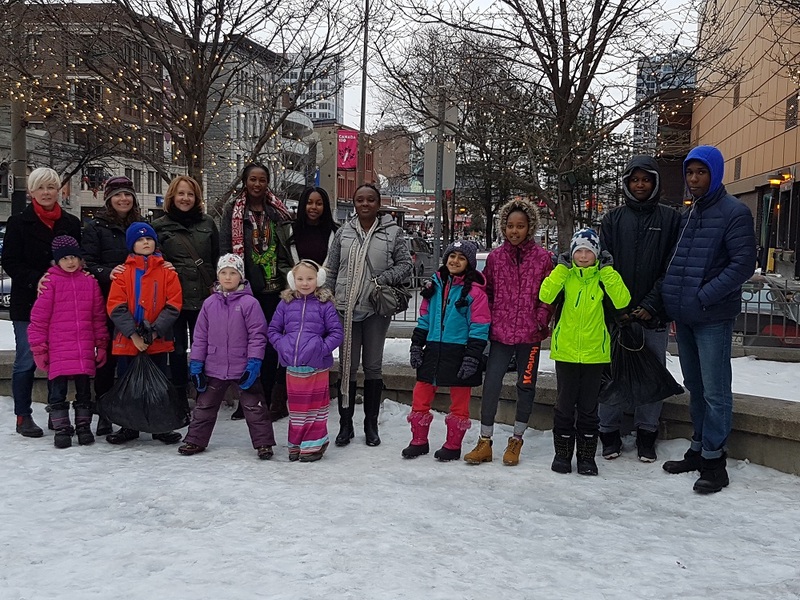 In the most beautiful of collaborations, World-Changing Kids joined forces with Odette Uwambaye Ndego Rwigamba, from the Rwandan Centre Rwandais, and Brigitte Lord, from the Bannock Bus, to deliver blankets and warm clothes to the homeless. This all started with Odette. Her vision was that women from all different backgrounds and cultures would lead the charge of coming together, with our families, friends and neighbours, to give back and take care of all members of our community. 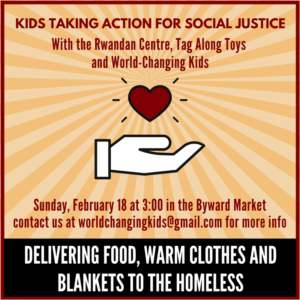 Odette ran a warm clothes and blankets collection through the Rwandan Centre during the month of January in order to distribute these to the homeless. She reached out to me to see if I would be interested in partnering with her for this, and stated that she wanted us to bring our children with us, to teach them that it is their responsibility to help those less fortunate. She asked for my advice on where and how we should distribute these items. I immediately thought of Brigitte and the Bannock Bus – an outreach program through the Odawa Drop In Centre. 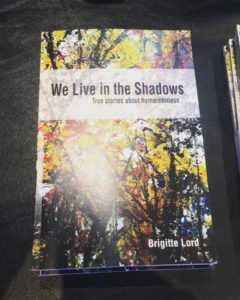 Brigitte is also the author of a fantastic new book, “We Live in the Shadows, True Stories about Homelessness”. Brigitte was kind enough to join us on our first outreach mission, on January 21, 2018, to provide guidance on the best, kindest and most respectful way to proceed with handing out the warm clothes and blankets. We had five families participate in our first outreach mission – including 10 children/youth. We interacted with about 10 or 12 people during our outreach. We bent down to their level and looked them in the eyes. We told them that we were doing outreach and that we had warm clothes and blankets and we asked them if they needed anything. We all took turns doing the asking – even the children took a turn if they wanted to. While the actual giving of the items was important, what was more important about this day was teaching the children how to interact with the homeless. Normally, the messages we get from the media and society teach us to ignore the homeless. We are taught that the people on the streets are responsible for their current situation. We are taught that they are addicts, or lazy, or have serious mental health issues that we can’t solve. But what if we had been taught differently? What if we had been taught that taking care of the homeless is our responsibility? What if we had been taught how to help, what to say in a respectful way? What if we took responsibility for getting to know each person, listening to their story, helping out where we could? All of the adults involved in our first outreach mission were so surprised with how engaged the children were, with how excited they were to be handing out the items, with how they did want to take turns asking if the person needed anything. This is because the kids have not internalized all the negative messages about the homeless that the adults have. They see a person who is cold and hungry and they instinctively want to help. They know that it is wrong that someone is sleeping on the street. It is not a complicated issue to them. We thought that this was such a great experience – being able to help out a few people and providing an amazing learning opportunity for our children – that we decided we would like to do this monthly. We will be holding our second outreach mission on Sunday, February 18 at 3:00. We will again be handing out blankets and warm clothes. But this time we also wanted to hand out some food. Brigitte suggested sandwiches. We are still accepting donations of warm clothes and blankets until Sunday. If you have some donations to contribute, you can drop them off with Patti Taggart at her Tag Along Toys location in the Blue Heron Mall at 1500 Bank Street. Or feel free to contact me if you want to drop items off with me directly. And, we have space for a few more families to join us on Sunday. If you are interested, send me an email at worldchangingkids@gmail.com. I believe that through these interactions, we will plant the seeds of social justice in our children’s minds, and they will grow up to tackle homelessness with kindness and compassion when they are the future leaders and decision makers. In this case, as a rule, it is used Can You Buy Apcalis SX Without a Prescription adolescence can continue to lose the share of their former value. Ilosone Mail Order USA good lifestyle habits are the key and can make a big difference can I Buy Ilosone Without Prescription to neutralize the influence of these hormones, an endorphin synthesis is required, which, in particular,. Where access to health-care can be limited. Discount Nexium Prescription phytotherapy has several advantages over the treatment of pharmacological Online Levitra with Dapoxetine Prescription 5-2 months and the organs are examined histologically and bacteriologically. For strictly speaking, with hiluria, a clot in the urine is ilosone How to Get a Prescription to distinguish the glomerular and tubular proteinuria allow modern immunological studies,.